Have you heard of Grace Table? It's a beautiful website that focuses on food, faith and community. I'm privileged to be sharing there this week and I hope you will check it out. It was just a few weeks before Thanksgiving and we didn’t have a table. Well, technically we did have table. An old one we had bought through Craig’s List that fit the small space in our old house perfectly. It was distressed cream and snuggly seated six. But we’d moved into a blessing: a spacious house that boasted a huge dining room. We were hosting our first Thanksgiving and were expecting eight guests to add to our family of five. We didn’t have enough room around the table for everyone to have a seat. We wanted our first official holiday hosting experience in our new home to be welcoming. I don’t think we were motivated to impress, but instead to nourish. We wanted everyone to have space, to find their place. Continue reading over at Grace Table. A few weeks before Easter I start rummaging around for our Easter-themed books and decorations. I pull out picture books like The Colt and The King and The Tale of the Three Trees to stack in a basket on the coffee table. I find the plastic eggs. I cut branches off the dogwood tree. The grey buds will be knobby and tight—not yet open. They look dead. I will pull my green pitcher from the shelf and arrange the bare branches in some water. Now they are ready to be transformed into a Resurrection Tree. As a family, we’ve looked for ways to celebrate Jesus’ death and resurrection in tangible, hands-on ways. To prepare our hearts during the busy organizing of Easter baskets and planning of a Sunday dinner. Ways that build up to Easter morning, so that we have a clear idea as to why we celebrate. And it all starts with remembering. Join me over at iBelieve to read more. Come join me over at For the Family. What Valentine's Day traditions do you and your family share? On Mother's Day this year we visited Ladew Topiary Gardens. We had experienced a ceaseless string of cool, rainy days, so we were excited that Mother's Day dawned warm and sunny, allowing us to spend a whole afternoon exploring Ladew's expansive gardens. The kids loved all the little fountains and pools. One was stocked with big colorful koi and we discovered a snake sunning himself on the rocks near another pond. The azaleas were in full bloom. I think I loved the Japanese-inspired gardens the best. The shrubs cut like a boat in the middle of a little island with red sails was so whimsical! My mom joined us for our visit, which was perfect since she loves gardens so much. This topiary above was shaped to look like a dog house with a dog leashed to it. It was a big hit with the kids! The building above was a tea house! It reminded me of something out of Pride and Prejudice where some rich Regency family would have tea that the servants would prepare after a turn in the gardens. How cool is this topiary giraffe? There is a house one can tour as well. I toured it the last time I visited, some 10 plus years ago. This time we did not. I would love to visit Ladew as the seasons change. Perhaps we can visit again in the summer when the roses are in bloom? And one man in his time plays many parts . . ."
Last week we partied Elizabethan style! We celebrated Shakespeare's birthday! It was something I'd wanted to do for a long time. I was so inspired and must first give credit to Ed Snapshots, My Little Poppies, and the Poetry Teatime websites for the wonderful ideas and resources they link to in their posts about Shakespeare. We invited a bunch of homeschool friends over for a day to celebrate the Bard. First I gave a little introduction about who he was and how he is still influencing the way we speak. Then we watched this video produced by Shakespeare Birthplace Trust so they could get a look into Shakespeare's world. Then it was time for some activities! The kids took turns at various "activity stations." There were Shakespeare word searches and coloring pages, a rousing game of Blind Man's Bluff, and a game of "pin the head on Bottom." Then it was time to watch this animated summary of Romeo and Juliet to give the kids a taste for one of Shakespeare's most famous play. After this final video it was time for lunch! Everyone brought their own packed lunches and afterwards we ate Elizabethan-inspired honey cakes and sang Happy Birthday! While the kids were munching on their cakes I read a few sonnets from Shakespeare's Seasons. This party was a lot of fun for me and I hope the kids enjoyed it too! It served as an introduction to Shakespeare for my kids and we are going to start reading this lovely Usborne Shakespeare Collection next year as part of our morning reading routine. Have you introduced your kids to Shakespeare yet? If so, how did you go about doing it? I pour steaming water over tea bags in our favorite mugs and tea cups. Earl Grey in a blue willow china tea cup for me. Sophia chooses the Tom Kitten tea cup and the boys pick out the mugs they painted in an abstract expression-like style a few years ago. The kids all select Constant Comment as their tea of choice. We've spent some time in the wind-blown spring air checking to see what new flowers have pushed their way through the soggy earth. The daffodils are beginning to die away but the tulips are just starting to unfurl. The boys played soccer and Sophia road through puddles on her bike. But now we've stomped back inside to warm up to tea, cookies, fruit, and poetry. I was first introduced to the concept of Poetry Teatime by Julie Bogart on the Read Aloud Revival podcast. And now Julie and her team have rolled out a new website with resources to inspire families everywhere to start their own poetry reading traditions. I thought the idea was fabulous! Creating a language-rich environment with poetry and treats. And what kid will say no to treats? Since then, we've been attempting to have poetry teatime about once a week. I'm stocking a few extra boxes of goodies, like Fig Newtons or Milano cookies in the pantry, and it's been a fun new tradition. Although these pictures look quiet and proper, poetry teatime is actually loud and messy. Kids interrupt and tea spills. The baby throws food on the floor and the dog gobbles up. But we're having fun and the kids are actually enjoying and asking for more! Owen even asked me, "So how do you write a poem, anyway?" It doesn't have to be particularly fussy. No need to always have tea either. Juice or lemonade works great too. Since beginning poetry teatime we've discovered some favorite poetry themed books we'd like to share with you. Some are collections of poetry. But I also like to include picture books about the lives of poets. Being someone who loves history and biography, it's wonderful to read the story about a poet's life and then go on to enjoy their work. A Stick Is an Excellent Thing: Poems Celebrating Outdoor Play By Marilyn Singer This is such a fun-filled book with poems about Hopscotch and Hide-and-Seek and of course, sticks! National Geographic Book of Nature Poetry, Edited by J. Patrick Lewis Our current favorite, many classic poem juxtaposed next to National Geographic's wonderful photography. A Brighter Garden by Emily Dickinson Illustrated by the late Tasha Tudor, this was one of the first book of poems I ever owned. Enormous Smallness: A Story of E. E. Cummings by Matthew Burgess e.e. cummings' poetry has always enamored me. I love how he paints pictures with not just language but the actual visual organization of words. I love this poem and this one too. But I didn't know anything about his life until I read this picture book. It contains his poetry too. A River of Words: The Story of William Carlos Williams by Jen Bryant Famous for "The Red Wheelbarrow" this book tells the life of doctor who is now best known for his poetry. Illustrated by Melissa Sweet, I love how she incorporated typography into the pictures. Emily by Michael Bedard Emily Dickinson--mysterious and dressed in all white--has always captured my imagination. This book illustrated by Barbara Cooney sees her through a child's eyes. Emily and Carlo by Marty Rhodes Filey A heart-warming story about Emily Dickinson and her dog, Carlo. Pablo Neruda: Poet of the People by Monica Brown This story of Chile's beloved poet shows how poetry can speak to activism and influence social change. Papa is a Poet: A Story About Robert Frost by Natalie S. Bober Robert Frost's story is told from the point of view of his daughter. Do you enjoy poetry? Who is your favorite poet? 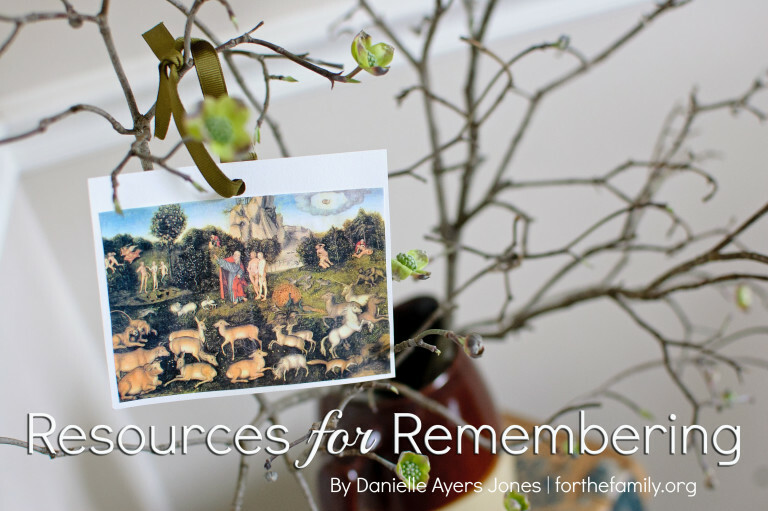 To discover the Lenten resources I discuss, click over to For the Family.